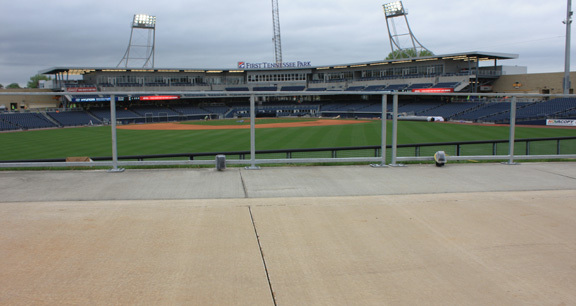 Project obstacles and solutions: The Nashville Sounds baseball team opened its new stadium, First Tennessee Park on April 17, 2015. The ballpark represents a fast tracked project that broke ground in January 2014, went through soil remediation and jumped a lot of governmental funding hoops to be ready for play. The joint venture of Barton Malow Company, Bell and Associates Construction, and Harmony Construction Group served as general contractors. Hemma Concrete poured and finished all the concrete. This project was full of delays and government funding problems. After construction had started, the soil was found to be contaminated and extra funding had to be approved for the cost overruns. Since the stadium is funded by municipal bonds, the extra money had to be worked out between the City of Nashville and the Tennessee State Legislature. Snowfall in the winter further delayed progress. When the extra financing was worked out and the weather broke, there was a major push to get the ballpark completed by the April 17 opening that kicked off eight games in a row. This included all of the flatwork on the concourse areas and sidewalks surrounding the ballpark. IMI supplied 800 yards of concrete around the clock for this project. This includes all of the walkways, steps, ramps, concession and restroom areas. Unique to this project was a golden hued colored concrete walkway that comes in the left field entrance and wraps around the outfield. First Tennessee Park opened as scheduled on April 17 to a packed house. The Nashville Sounds defeated the Colorado Springs Sky Sox 3-2. This project is projected to achieve LEED Silver certification.